Here at Pet Beauty Shop, we groom and board dogs (excluding pit bull terriers & chows) and cats of all shapes and sizes. We have been serving the community since 1978 and with the current owner since 1994. We are by appointment only, so please call us for all your grooming and boarding needs. 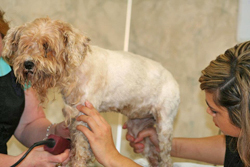 Our experienced pet groomers attend grooming seminars annually to learn the latest techniques as well as important information regarding pet grooming. 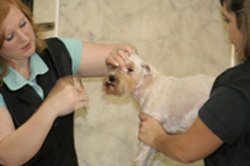 Pet Beauty Shop was voted one of Lufkin's Best Pet Groomers 2007-2010. We believe in treating your pet as our own.